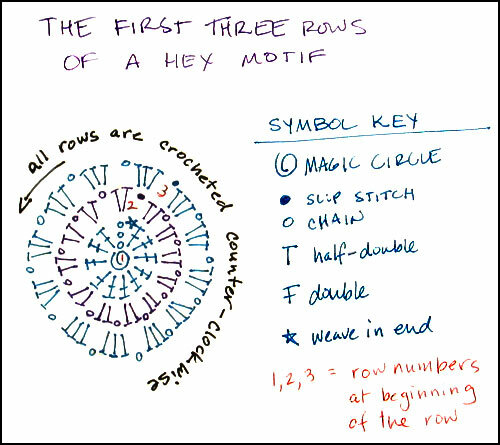 Episode 1 - The first three rows of a hex motif. Make 26 to start The Hex Tote. After all the wonderful name suggestions (OMG, Bagasaurus Hex?! So amazing), I settled on a simple "The Hex" as the name. And since it's a tote ... The Hex Tote. For my bag, I used Lily brand Sugar 'n Cream worsted weight cotton yarn. I used what I had on hand, which is why the colors aren't used equally. I'm not sure how much yarn it takes, but the nice thing about granny motifs is that if you have to pick up more yarn later, the dye lot doesn't matter since the same color is never touching itself. I used a 3.75mm hook so the stitches would be super dense. I didn't want a lot of the lining peeking through my motifs. You can make this bag with any size/type yarn and any size hook you'd like, there are no rules. Let me know if you have any more initial questions.